Former NHLer Colton Orr traded in throwing fists on the ice for standing in front of the camera. TORONTO (AP) The hardest part for Colton Orr was pretending. 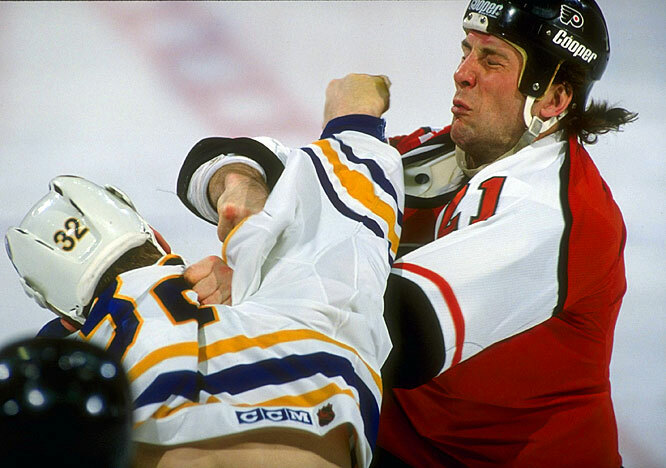 After duking it out many times in an NHL career that spanned almost 500 games, Orr was trying to pretend he was fighting in front of the camera as a first-time actor in Goon: Last of the Enforcers. It's the latest step in the spotlight for the 35-year-old former enforcer. All that is beginning to change as he adjusts to life with wife Sabrina and their two young children. Not only will Orr have a part in the Goon sequel that features Seann William Scott and Liev Schreiber, he's also getting into broadcasting with SportsNet New York. His real-life story slightly resembles that of Doug Glatt, the main character in Goon (Scott), an enforcer forced to confront the end of his playing career. Unlike Orr, who stepped away for good as the NHL transitioned away from enforcers, Glatt decides to give his dream another go. ''It's not always easy when you retire from something that you did for so long, that was your livelihood and everything you've done since you were a kid,'' said Orr, who is also coaching youth hockey and working with the Rangers' alumni program. Orr was thrilled when Jay Baruchel, the film's Canadian writer and director, asked him to be involved. 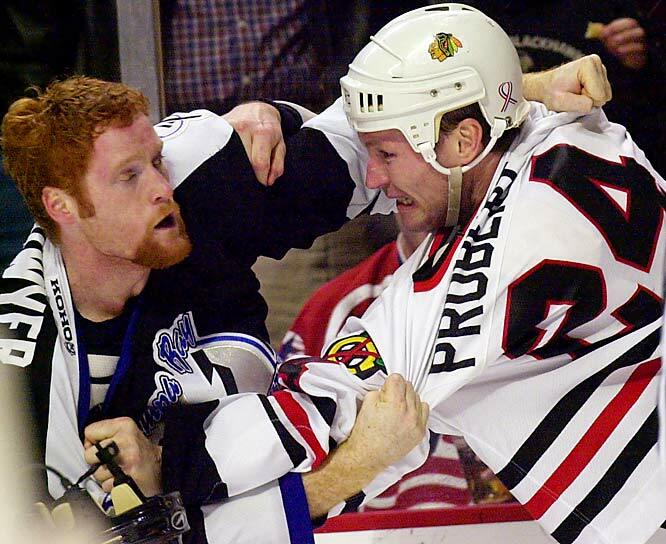 Ever since the NHL's early days when Montreal's Sprague Cleghorn terrorized the ice, the league has housed pugnacious souls whose primary function is protecting their more skilled teammates by intimidating opponents into steering clear, and delivering swift and terrible fistic punishment upon transgressors. One such character was Grimson, Detroit's 10th round pick in 1983. 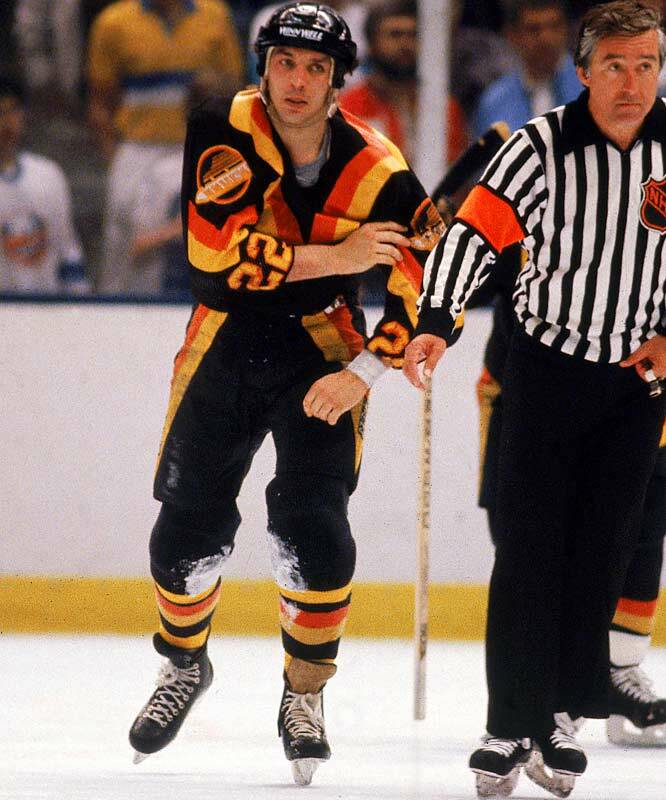 The Grim Reaper stalked the ice for eight teams, accumulating 17 goals and 2,113 penalty minutes. 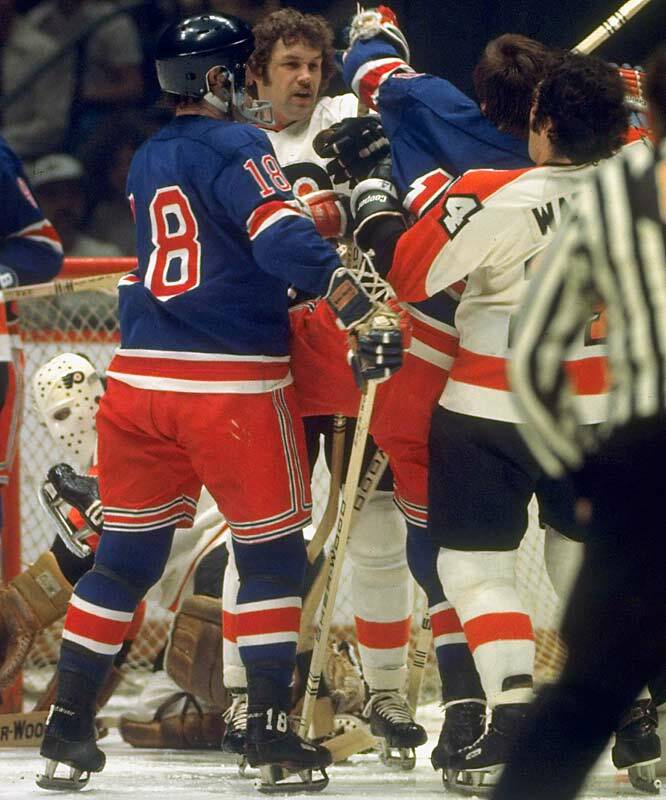 The quintessential Broad Street Bully is best known for beating the feathers out of hapless Rangers defensemen Dale Rolfe in a 1974 playoff game. The Hammer set the single-season mark of 472 penalty minutes during the Flyers' second straight Stanley Cup campaign (1974-75). No one spent more time in the sin bin than the ferocious Tiger -- a grand total of 4,421 minutes (including playoffs), the equivalent of a little more than three days. The Blues' ninth-round pick in 1988, The Twister was unafraid of any opponent. He even took on the creators of the Spawn comic book series over their use of the name Anthony "Tony Twist" Twistelli for a mob enforcer and won a $15 million court settlement. 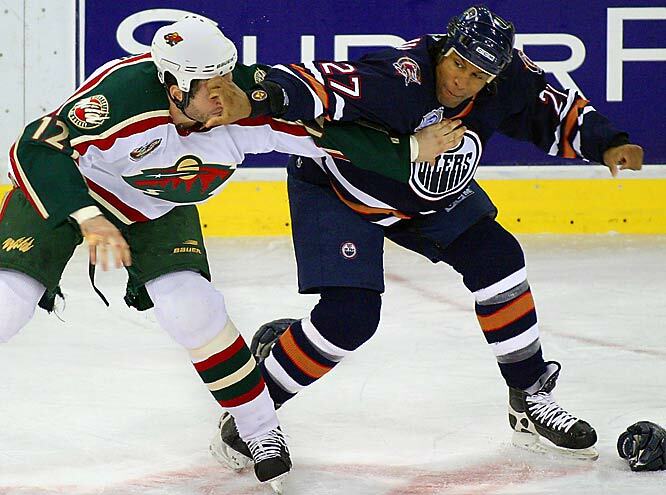 A fan favorite in Toronto, New York and Winnipeg, the relatively diminutive Domi (5' 10", 213) battled all comers. Inspired by his childhood hero Tiger Williams, Tie racked up 1.020 PIM (third all-time) and ably rode shotgun for Maple Leaf stars Doug Gilmour and Mats Sundin. A bad boy on and off the ice, he was one half of the Detroit's feared Bruise Brothers (with Joey Kocur), watching Steve Yzerman's back and keeping his gloves on long enough to become an All-Star in 1987-88. He also plied his rough trade in Chicago. The other half of Detroit's Bruise Brothers actually led the NHL in PIM (377) in 1985-86 while skating with feared enforcer Bob Probert and the equally ungentle Randy Ladouceur. 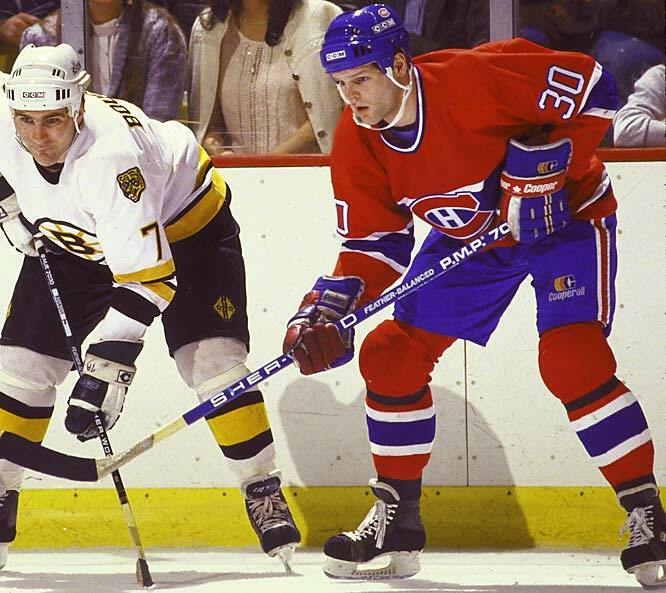 Kocur later mixed it up for the Rangers and Canucks. Marty Mac (bottom) had Wayne Gretzky's back in L.A., succeeding Dave "Cement Head" Semenko, the Great One's protector in Edmonton. 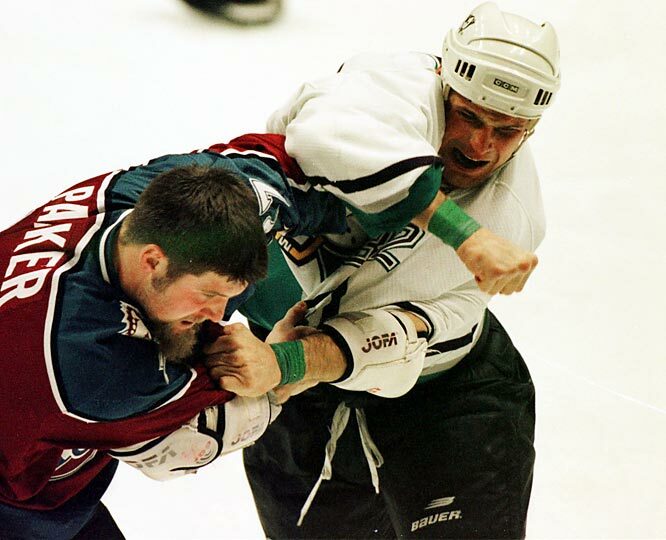 With Boston, McSorley got himself charged with assault and suspended indefinitely for applying a stick to the head of Vancouver enforcer Donald Brashear in a 2000 game. 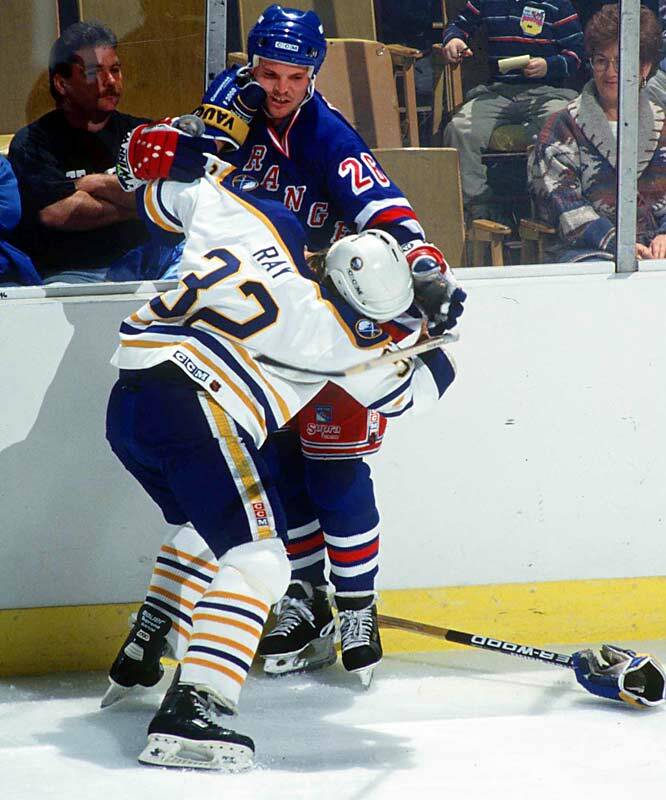 About as subtle as a flying mallet, Knuckles Nilan racked up a record 10 penalties (six minors, two majors, 10-minute misconduct, game misconduct) in one memorable tilt against Hartford in 1991. 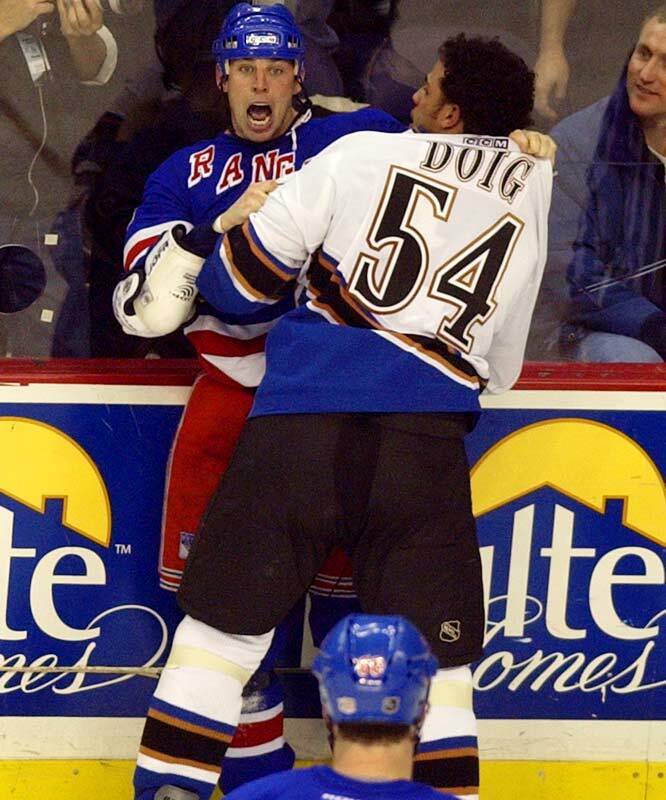 He had two stints with Montreal and threw punches for the Bruins and Rangers. He was also the subject of the 2011 film about enforcers called <italics>The Last Gladiators</italics>. 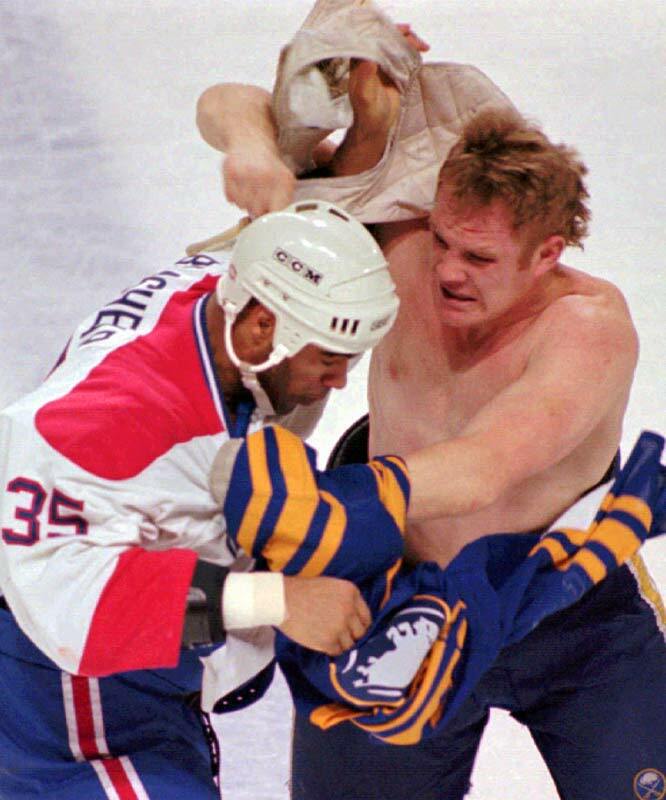 Buffalo's eighth-rounder in '88 was as cagey as he was feisty -- a master at peeling off his sweater and equipment so opponents had little to grab. 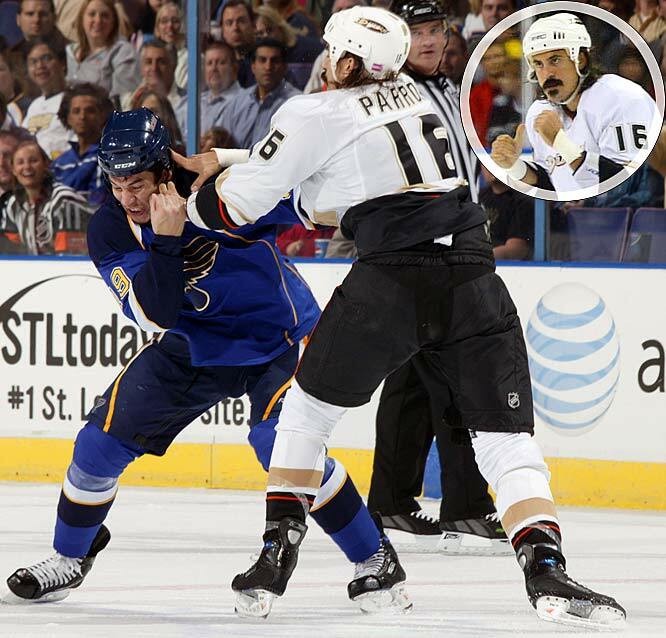 The NHL was moved to hit "The Rayzor" with equipment rules violations. 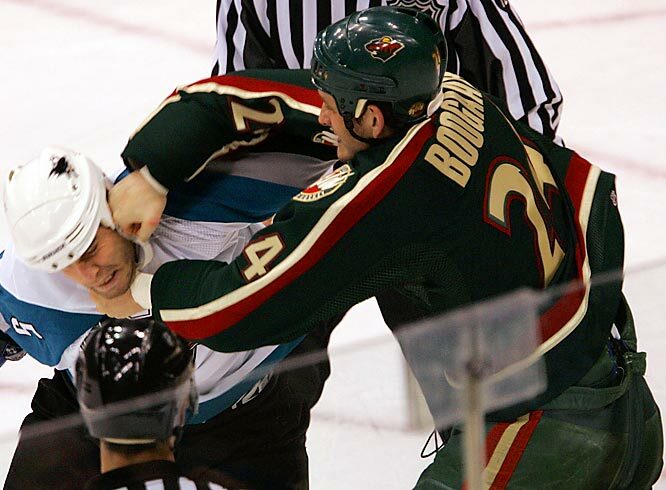 At 6'8", 243, <italics>The Hockey News</italics>' Best Fighter of 2003 is still going strong in Phoenix, as his decisive victory in a 2006 heavyweight bout with Minnesota masher Derek Boogaard clearly demonstrated. Laraque retired with 1,126 PIM. At 6-7, 250, the brutal Boogeyman was no one to dance with, but he paid a terrible price for his role as a fighter. Addicted to the painkillers he used to play through his injuries, he died of an overdose at age 28. 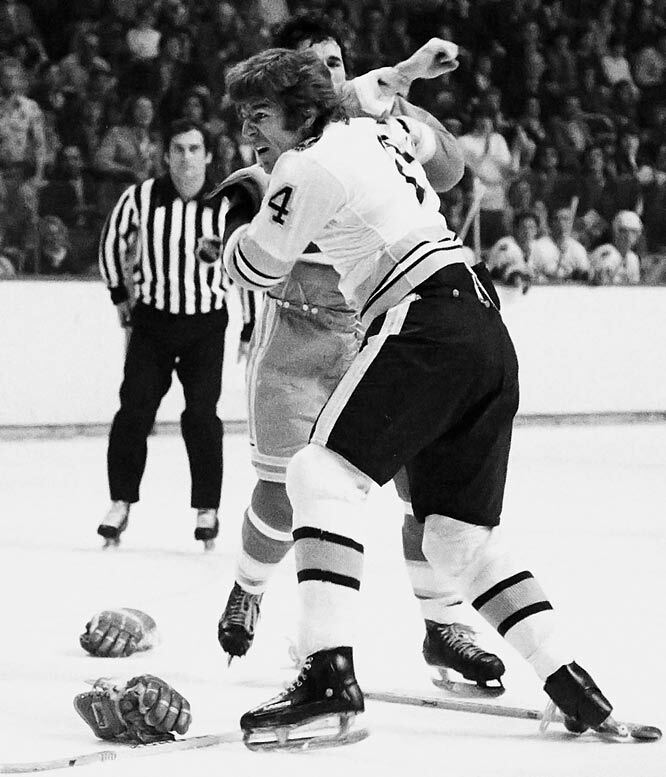 A diminutive (5-8, 175-pound) wrecking ball, Jonathan was a favorite of coach Don Cherry and Bruins fans for six seasons (1976-82). He was a fearless checker and hellacious fighter, often taking on such heavyweights as Dave Schultz and Moose Dupont, and winning. His most hair-raising bout was against Montreal's Pierre Bouchard on May 21, 1978. The link below is not for the faint of heart. A teammate of Stan Jonathan and charter member of the Big Bad Bruins of the `70s and early 80s, O'Reilly was turbocharged power forward with a cerebral streak (he often kept his nose buried in books) who nevertheless earned coach Don Cherry's ultimate kudo: "He's tough, really tough, and that's the way I like em'." O'Reilly's bouts with Clark Gillies and Behn Wilson are considered classics. The aptly nicknamed "Cement Head" was Wayne Gretzky's bodyguard on the dynastic Oilers of the 1980s and often cited as one the key reasons the Great One could roam untouched and wreak such havoc. The strapping Semenko did his part by parking his carcass in front of the net or dismantling any and all who dared touch No. 99. 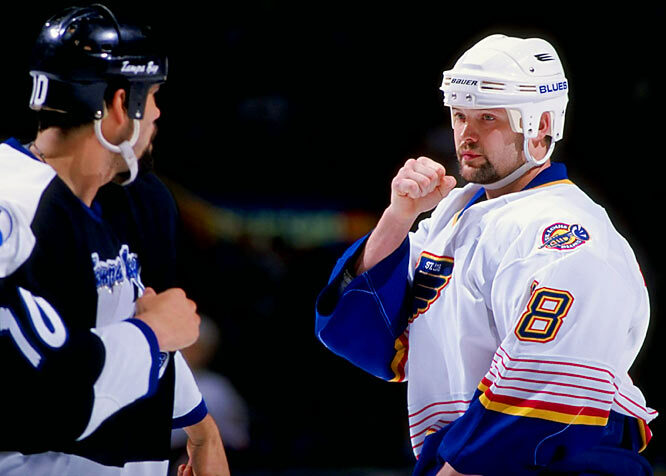 Teammate Kevin Lowe saluted Semenko by calling him "the Gretzky of the tough guys." A classic Flyers bully, Brown roamed the ice for Philly, through the 1980s and again in the 90s after a stop in Edmonton, making life very unpleasant for anyone who took liberties with his teammates. A ferocious puncher, the 6-5, 220-pound winger was so feared that sometimes only a glance, a word or a tap on the shoulder from him would be enough to send a foe scurrying for safety. A prominent member of a new generation of Flyers assailants, the 6-2, 216-pound winger seemed programmed for mayhem in a way that suggested an almost cyborg-like mindset. 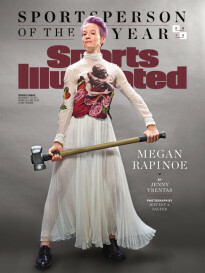 As one foe observed to SI.com's Michael Farber, "Cote doesn't even know there's a puck on the ice." One of the more unusual members of the hellbent-for-leather set, the mustachioed Parros is an urbane gentleman with an economics degree from Princeton. He's mainly been putting it to good use by economically pounding the feathers out of opponents for the Kings, Avalanche, Ducks, and Panthers before being dealt to the Canadiens in July 2013. One of the game's great yappers and disturbers, the 6-foot, 188-pound Barnaby would fearlessly concede 50 pounds or more to his opponents. 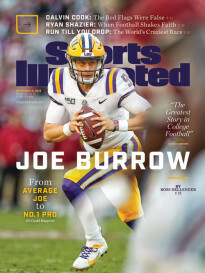 He was beloved by the fans of seven teams for his heart and scrappiness. The legendary Mister Hockey may be beloved, but he was as nasty as they come in the corners and with the gloves off. 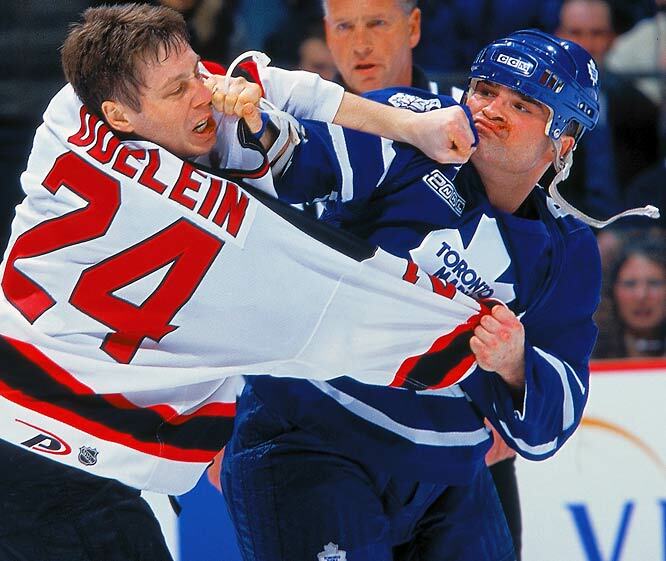 He set the tone during his rookie season, knocking out Montreal's equally-tough Rocket Richard with one punch. Howe's greatest bout may be his battering of Rangers' tough guy Lou Fontinato into a pulp at Madison Square Garden in 1958. 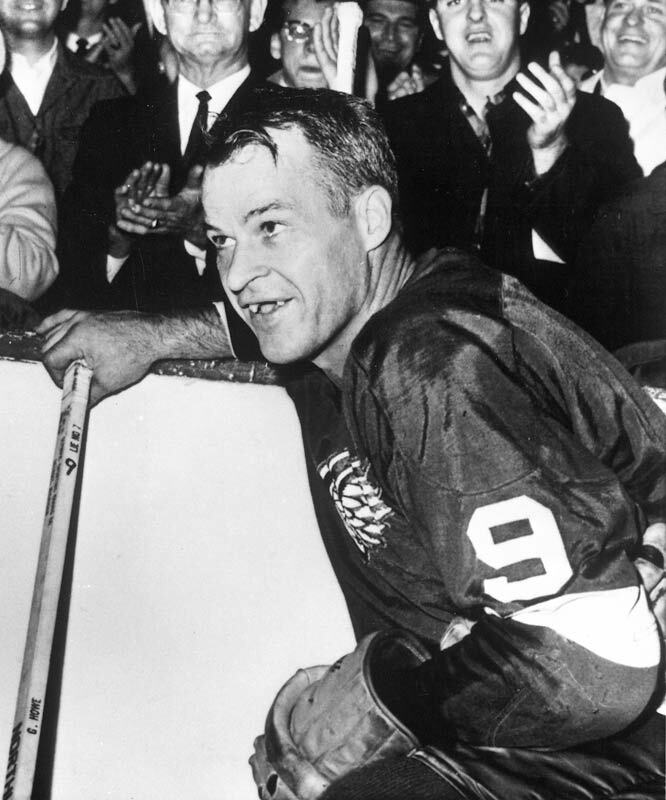 His blows were described as sounding like an axe splitting wood, and "a Gordie Howe Hat Trick" is a classic hockey term for having a goal, an assist and a fight in the same game. Orr was excited to get a trailer of his own on set and spent time between shoots catching up with longtime colleagues like George Parros and George Laraque - both of whom were in the film - as well as some of his acting heroes. A film and TV buff, Orr was a fan of Scott from American Pie, Schreiber from Ray Donovan and Baruchel for his role in Tropic Thunder. ''You watch these guys all the time, you see them on TV and in interviews so it was kind of surreal being on set with them and being part of their movie,'' Orr said. 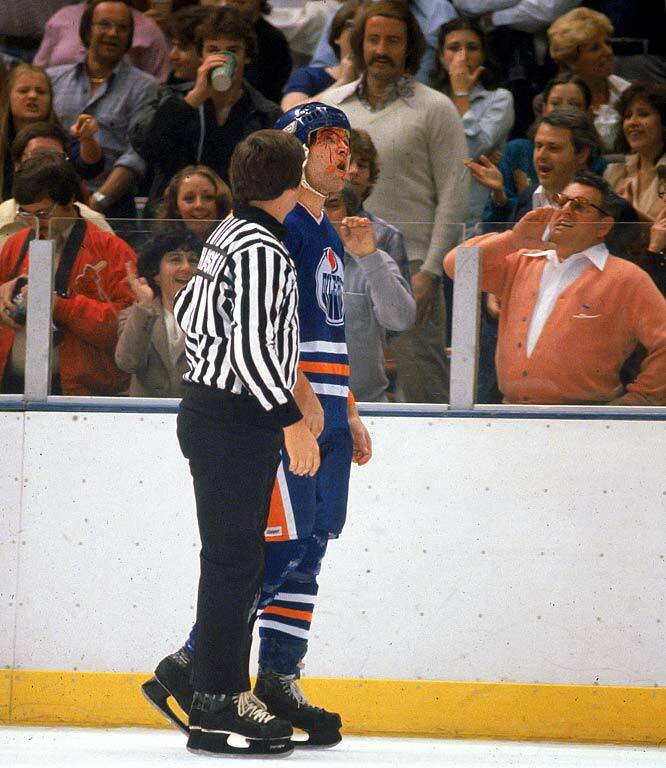 As if he were a professional wrestler, Orr was having to sequence his usual fighting motions to script - right punch, left punch, upper-cut - and sell it hard when he supposedly got hit.